Peel and dice onions. Peel potatoes and cut into slices of medium width. Add eggs to a large bowl, whisk until creamy, and season with salt and pepper. Set aside. Heat a generous amount of vegetable oil in a frying pan over medium heat. Add potatoes and cook for approx. 10 - 11 min. until potatoes are cooked through. Remove excess oil. Add onions and continue to sauté, stirring occasionally, for approx. 2 - 3 min. until softened. Pour in eggs to cover potatoes and cook approx. 8 - 10 min. over low heat until the bottom and the edges have set. Then run a spatula around edges of pan. Place a large plate on top. 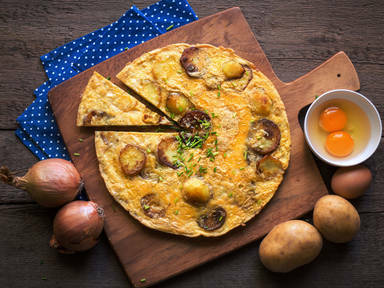 With one hand securing the plate and the other holding the handle of the frying pan, quickly flip the tortilla onto the plate and slide back into pan with raw side down. Cook on the other side for approx. 4 - 5 min. until egg is cooked through. Alternatively, transfer pan to oven and bake at 200°C/400°F until cooked through for approx. 10 min. Transfer to a plate to serve and cut into pieces.